PHAB UNITED in their new strip! 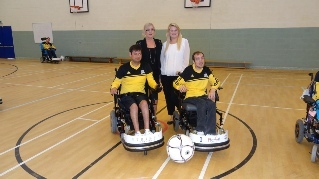 Meet the members of our latest project - powerchair football. 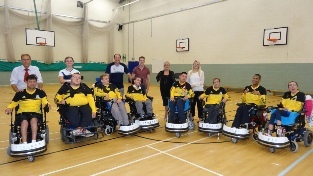 Following a disability exhibition at Leeds United’s Conference Centre earlier this year the idea of forming a PHAB power-chair football team was discussed and on 20th April we had our very first training session. 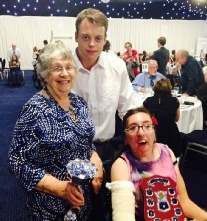 On 6th July we played in the Power-chair Tournament staged at the Edge, Leeds University. In November we will compete in the Yorkshire league with other teams in the region. Many thanks to everyone who has supported the team and helped with funding - if you would like more details please see Janine, Paul or any of the players. 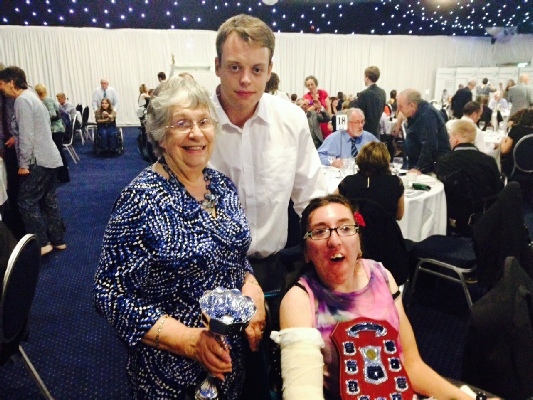 At the Disability Sports Yorkshire Awards Dinner at Elland Road (September 2014) Ann Hart received the Volunteer of the Year Award for her efforts to introduce more PHAB members into playing sport after watching the Paralympics.